Remove rear seat back. Refer to Rear Seat Back Cushion Removal and Installation. Remove the rear compartment stowage shelf. Refer to Rear Compartment Stowage Shelf Replacement. Remove the rear compartment sill trim plate . Refer to Rear Compartment Sill Trim Plate Replacement. Remove the rear shoulder belt. Refer to Shoulder Belt Replacement - Rear. Use a trim tool or equivalent to aid in removal. 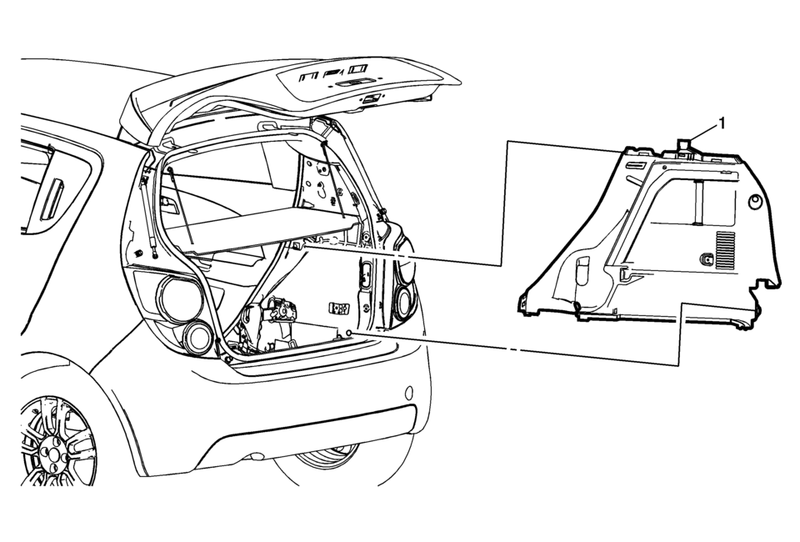 After installation of the quarter inner trim panel, ensure the rear seat belt is not trapped under the trim panel. Pull up on the belt to verify full movement of the belt.